What does the 2019 Jeep Cherokee provide in Performance? The brand-new Cherokee can hit an EPA estimated 22 mpg in the city and up to 31 mpg on the highway. Towing starts with a standard 2,000 pounds and maxes out at a notable 4,500 pounds with the 3.6L Pentastar V6 engine. Find three available engine options the the Cherokee- including the 2.4L Tigershark® MultiAir® 2, 2.0L Turbo, and 3.6L Pentastar V6 engine. The Jeep Active Drive 4x4 systems include Selec-Terrain® Traction Management Systems and drive modes. Available skid plates and sealing of electrical components increase off-road protection. Enjoy your next camping trip near Lebanon, or daily commute, with the fun and effective 2019 Jeep Cherokee. 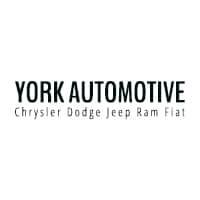 Discover a bold new design and the utility required by off-road enthusiasts at York Chrysler Dodge Jeep Ram FIAT. Offering award-winning customer service, our experienced associates are ready to answer any questions you have!